The net around embattled former Malaysian Prime Minister Najib Razak and his associates is tightening with investigations into his administration’s alleged misdeeds ratcheting up this week. Prime Minister Mahathir Mohamad declared Najib “totally responsible” on Tuesday for a massive alleged fraud from state fund 1MDB while outlining potential charges against the former PM. Then two days later police announced they would reopen the case of the 2006 murder of a Mongolian model who had worked on the purchase of two submarines when Najib was defense minister, local media reported. 28-year-old Altantuya Shaariibuu was shot and then blown up in a forest with military grade explosives. “I can confirm we are reopening investigations,” Inspector-General of Police Tan Sri Mohamad Fuzi Harun reportedly said, adding the deceased’s father had filed a complaint raising new evidence. Two former police officers who were serving as members of Najib’s security detail at the time were convicted of murdering the model, who had worked as an interpreter for Abdul Razak Baginda – then an adivsor to Najib. Abdul Razak was acquitted of abetting the officers in 2008 in a case civil society groups and corruption watchdogs have alleged was a government cover up involving kickbacks. Najib has consistently denied any connection to the incident while Abdul Razak Baginda has denied any responsibility for the death of Altantuya, with whom he had an affair. Mahathir Mohamad, who defeated Najib in a stunning election upset in May, said earlier in the week that investigators would likely seek to charge the former PM with embezzlement, bribery and “a number of other charges” over his role in the 1 Malaysia Development Berhad scandal. Mahathir told the Reuters news agency Malaysian investigators had a near “perfect case” against the principal perpetrators of the 1MDB scam, in which the US justice department alleges some $4.5 billion was siphoned out the state fund, with $700 million landing directly in Najib’s account. “He was totally responsible for 1MDB. Nothing can be done without his signature, and we have his signature on all the deals entered into by 1MDB. Therefore, he is responsible,” Mahathir said. At a five-star hotel on the Malaysian tourist island of Langkawi, Najib told Reuters in his first interview since the shock election loss that he did not know if the hundreds of millions of dollars that moved through his personal bank account came from 1MDB. Najib, who was chairman of 1MDB, said the fund’s board should have told him if something was wrong, claiming he was unaware if paintings, yachts, gems and prime real estate had been purchased to launder money from the fund. “I was not aware of these purchases. This was done without my knowledge. I would never authorize 1MDB funds to be used for any of these items. I’ve been in government so long, I know what’s right and what’s wrong,” he said. As for the hundreds of handbags, some worth hundreds of thousands of dollars each, jewels and other luxury items seized from his properties, Najib said these were gifts. He has previously said $681 million that ended up in his bank account was also a gift – from the Saudi Royal Family, most of which he gave back. “People would expect a former prime minister to be treated with decorum. Instead, I’ve been subjected to raids and all the other things,” he said on Wednesday. Malaysians are growing impatient to see Najib charged after a massive electoral backlash that most observers believe was primarily driven by public outrage over the 1MDB scandal. But while the Pakatan Harapan coalition that ousted him are just as eager to see Najib charged, observers say they are also determined to ensure the highly complex case which requires coordination between justice departments across the globe is absolutely rock solid. 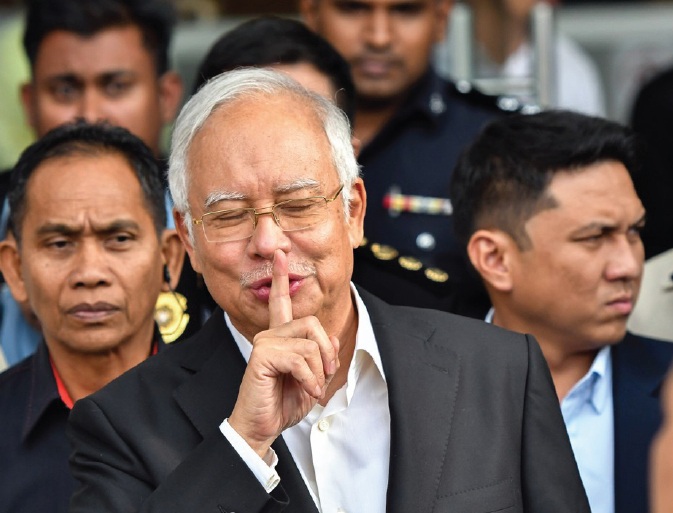 James Chin, Director of the Asia Institute Tasmania at the University of Tasmania, said he expected charges against Najib to come within about three months. “So I think the Malaysian people want the government to move very fast but as I mentioned earlier because this is a legal complex issue with multi jurisdictions it will not be so simple,” he said. The US, Singapore, Switzerland and Luxembourg have all conducted investigations into 1MDB, in which officials from a Saudi Arabian energy firm and a flamboyant Malaysian financier have also been implicated. That financier, Low Taek Jho, gave paintings by Picasso and Jean-Michel Basquiat to Leonardo DiCaprio and helped finance The Wolf of Wall Street using stolen 1MDB funds, US prosecutors alleged. Mahathir said this week that Low Taek Jho, better known as Jho Low, was hiding in “many countries” that did not have extradition treaties with Malaysia. Cynthia Gabriel, executive director of the Center to Combat Corruption and Cronyism in Kuala Lumpur, told VOA that coordinated investigations were starting to paint a much fuller picture of the scale of alleged corruption committed by Najib’s administration. “What’s out there is only 70% or so of the malfeasance. We are uncovering a lot more,” she wrote in an emailed response. God-there is no deity save Him; His [alone] are the attributes of perfection!